Judi Dench’s Last Turn as “M” In Skyfall? | The Cineaste's Lament. ← The Five Funniest Movies Of All Time? Judi Dench’s Last Turn as “M” In Skyfall? “The latest rumour to hit the tabloid carousel originates from the previously little-known Brit website Best For Film, and has been swiftly picked up by gossip-hungry red-tops. It suggests that Judi Dench’s M, head of MI6, and 007’s tough yet occasionally tender boss, has scolded 007 for the final time. “We’ve just filmed M’s death scene. 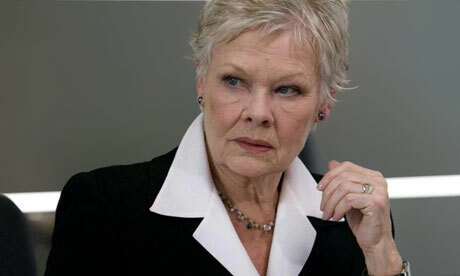 Judi Dench is leaving the franchise,” a member of the Skyfall production crew reportedly told the site. This entry was posted in action, Film News, James Bond and tagged Daniel Craig, James Bond, Judi Dench, Sam Mendes, Skyfall. Bookmark the permalink.